Golfer's Elbow (or medial epicondylitis) is a painful elbow condition that is caused by an inflammation of the tendons that attach to the medial epicondyle of the humerus. The medial epicondyle of the humerus is the bony projection that is located just above the elbow joint, on the inside of the arm, in line with the palm of the hand. The elbow is essentially a hinge joint, however, it also has limited rotational capabilities. This dual function of the elbow joint makes it a complicated joint and susceptible to injuries. The humerus: the upper arm bone. The ulna: the large bone of the forearm in line with the little finger. The radius: the smaller bone of the forearm in line with the thumb. Medial View of Elbow The medial epicondyle is the bony projection of the humerus on the inside of the arm, in line with the palm of the hand, just above the elbow joint. The muscles of the forearm that are responsible for the symptoms of Golfer's Elbow begin in the palm of the hand and wrist, travel up the forearm, cross the elbow joint and end in one tendon that attaches to the medial epicondyle of the humerus. These muscles are known as the wrist flexors. The wrist flexors are located on the palm side of the forearm, and bend the wrist down towards the floor. Muscles do not attach directly to bone. Muscles attach to tendons which in turn connect the muscles to bone. Tendons are made of strong smooth fibers that do not stretch when pulled. This inability to "give" makes tendons susceptible to inflammation, strains, and small tears when the tendons are subjected to strong forces, or repeated over-use injuries. The inflammation, strains, and small tears produce the pain of Golfer's Elbow. The most common symptom of Golfer's Elbow is pain and tenderness on the medial epicondyle of the humerus. As this condition worsens, the pain may spread down the inner side of the forearm. The muscles on the inside of the forearm may feel tight and sore. Flexing the fingers and bending the hand down at the wrist, especially against resistance. Grasping things will make the pain worse: the tighter you hold the object, the worse the pain becomes (an example would be grasping a tennis racquet or a bottle). Twisting the forearm and hand into a palm down position. The symptoms of Golfer's Elbow usually begin gradually after doing the same type of work or recreational activities for several years (this is known as an over-use injury). However, these symptoms can also develop suddenly after a single violent muscle exertion, or an elbow injury. A common test that doctors perform to identify Golfer's Elbow is to have you hold your hand with the palm facing out, then bend your wrist down (fingers pointing to the floor), while the doctor applies mild resistance to this movement. If you experience pain near the elbow when performing this motion, there is a good chance that you have Golfer's Elbow. The most common cause of Golfer's Elbow is over-use of the muscles which attach to the medial epicondyle of the humerus, just above the elbow joint. In other words, if the flexor muscles of the hand, wrist, and forearm are strained or over-used, they become irritated, inflamed, and swollen. This produces pain and tenderness at the medial epicondyle of the humerus. If alowed to progress, the tendon develops small tears in it at its attachment to the humerus. By this time, the pain is quite intense. This is the point at which most people seek advice about this condition. Rotation, flexing the wrist, and gripping are particularly hazardous when done while the arms are extended forward. Treatment or Prevention: The old adage, "An ounce of prevention is worth a pound of cure," is most apropos when trying to prevent the debilitating effects of Golfer's Elbow. If the symptoms of Golfer's Elbow are not prevented or treated in their earliest stages, they may produce such debilitating pain that only a complete life style change will relieve their symptoms. Protection. 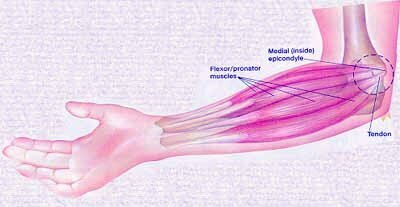 By gently limiting the pull of the flexor tendons on the medial epicondyle, healing will occur more quickly. This is best accomplished with the use of one of our Elbow Braces. 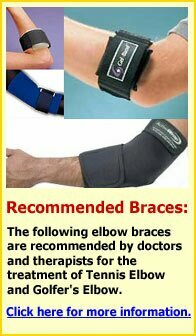 We have found these braces to be soft, comfortable, and uniquely effective. Our braces will help to reduce pain, inflammation, swelling, and healing time! Not only are they effective in the treatment of Golfer's Elbow, but they are also recommend for preventing reoccurrence of this problem. These braces allow you to "jump-start" the healing process! Rest. This means to stop doing those activities that cause your elbow to hurt. Avoid any activity that requires frequent bending of the fingers, hand, or wrist. Ice. Apply ice to the elbow for 20 minutes every few hours. This will help to reduce inflammation, swelling, and pain. If the ice becomes uncomfortable, discontinue its use immediately. Ice, and later heat, can easily be combined with compression when you use our ActiveWrap Hot/Cold Elbow Therapy System. This brace will not only provide your painful elbow with soothing cold or heat, but it will gently cradle and protect it from further injury. Once the inflammation has subsided, mild and comfortable moist heat may be applied to the strained forearm muscles and elbow. This will bring more blood to the area, and speed up healing. Use moist heat for 20 minutes every few hours. If the heat is uncomfortable, stop it immediately. Sometimes combining moist heat treatments, followed by ice packs, will not only hasten healing, but will help to reduce pain (try after the first 72 hours). When the pain subsides, you should try a gradual return to "modified" activities with the use of a brace which will protect, support, and stabilize the muscles and tendons of the forearm. Our Elbow Braces are designed to speed up the return to "normal activities," and reduce the chances of elbow pain returning. 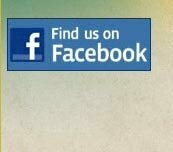 If you are careful, but the pain returns, we suggest that you seek medical care. The use of one of our recommended Elbow Braces, especially in the early stages of "return to full activities," will help to prevent a reoccurrence of Golfer's Elbow symptoms. Our braces allow normal movements, but help to prevent those excessive and abnormal movements that will strain, inflame, and tear the tendons that attach to the elbow. Do not keep your arm fully extended when hammering. Bend the elbow. This will reduce the pull of the tendons on the lateral epicondyle of the elbow. Use a hammer that fits your hand comfortably. If the hand-grip diameter is to narrow or thick, you will tighten your grip excessively. After many hours of gripping too hard, the flexor muscles in the forearm will pull excessively on the elbow. This may lead to an episode of Golfer'sElbow. If you are a house painter, use a brush that fits your hand comfortably, and one that is not excessively heavy. Also, use smooth painting strokes....try to avoid jerky hand and wrist motions. This will reduce the chances of Golfer's Elbow occurring. Try not to fully extend your arm when performing these activities. Keep the elbow bent, even if it is only a small amount. Use smooth movements rather than jerky ones. Do stretching and strengthening exercises before you begin work. (See the next paragraph for some examples of these exercises). Try to keep your elbows bent when lifting. Keeping your arms fully extended when lifting heavy loads will strain the forearm muscles at their attachment to the elbow. Stretching and strengthening exercises for the flexor muscles of the hand, wrist, and forearm are important to help prevent further episodes of Tennis Elbow. If the muscles are strong, they will have less tendency to succumb to an injury...strong muscles can fight off stress better than weaker muscles. Exercise should begin only after healing has occurred to the point that the exercises do not increase pain. Use good judgement when exercising: start slow, do not overdo, and stop immediately if pain begins. Stretching the flexor muscles (those muscles that flex the fingers and wrist): While the arm is held straight out and the palm is up, push the palm backward to stretch. This stretching exercise is held for 10 seconds and repeated several times. Repeat this exercise 5 times a day. If this exercise is painful to do, stop immediately. Strengthening exercises may begin once the symptoms of Golfer's Elbow have subsided. If pain begins during or after performing these exercises, stop immediately. The following two exercises should be performed twice a day, after the stretching exercises have been performed. The easiest way to perform these strengthening exercises is to sit in a chair with your elbow supported on the arm of the chair, and the wrist hanging over the arm. Use a light weight object, such as a soup can, when performing these strengthening exercises. Repeat the exercises 10 to 20 times, twice a day, but do not push yourself to the point of pain. If these exercises cause no pain, gradually increase the number of repitions to between 30 and 50 each time that you do these exercises. Strengthening wrist flexor muscles: Hold the can in the hand with the palm facing up. Pull the wrist up, hold for 2 seconds and then slowly lower the wrist to the original position. Strengthening the extensor muscles: Hold the can in the hand with the palm facing down. Extend the wrist, or bend it upward, so that it is pulled back. Hold this position for 2 seconds and then slowly lower the wrist to the original position. We have found that the Aircast Tennis Elbow Armband is a truly effective brace for the treatment of Tennis and Golfer's Elbow, because it allows you to target your specific "pain zone," and treat it with maximum efficiency! This is another uniquely effective elbow brace because it contains a Gel Pad which can be removed and cooled or heated. Treat Tennis Elbow or Golfer's Elbow while keeping active. This uniquely designed Tennis and Golferís Elbow Strap is more effective and comfortable than conventional supports. Here ís why, Two Straps Are Better Than One. Double straps mean exceptional support and pain relief. Option: Small/Medium: 7-12" Large/X-Large: 12-15"
Patented design for targeted relief. Allows easy cold/heat therapy and comfortable compression while on the go!